Voting Made Accessible | Where It's AT. The Ability Tools Blog. One in five people eligible to vote have a disability. 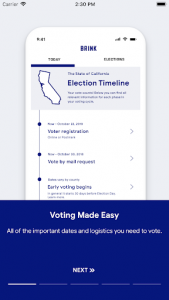 With Election Day 2018 just around the corner, Ability Tools is sharing resources on voting accessibility, apps, and guides. If people with disabilities voted at the same rate as people without disabilities there would be about 2.2 million more voters in the 2016 elections. According to the American Association of People with Disabilities (AAPD), 16 million people with disabilities voted in the November 2016 elections. The voter registration rate of people with disabilities was 2 percentage points lower than that of people without disabilities. What hindered voters with disabilities? The lower voter turnout was due both to a lower registration rate among people with disabilities, and to lower turnout among those who are registered. The disability community is making conscious efforts to tackle the issues of low turnout. The Disability Organizing (DO) Network, a program of the California Foundation for Independent Living, is working throughout the state to make sure that Californians with disabilities are informed and educated as part of the voting public. Another reason for low turnout among the disability community is not having accessible options and resources. Efforts are also being made to address these issues. Apps like Brink are making the voting process easier and literally– in the palm of your hand. 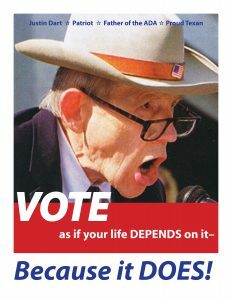 Please visit the DOnetwork’s voting resource page or the AAPD California resources page. The ADA: A Huge Help!